aFe 51-81174 - aFe Magnum Force Cold Air Intake - FREE SHIPPING! 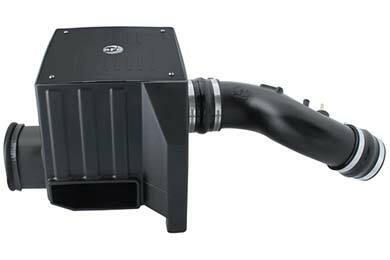 This intake looks and sounds great! Installation was not a complete breeze but I'm not the most handy. For the mechanically inclined probably have it done in an hour tops. Why I didn't give it a higher over all is the loss of mid range power. Better throttle response and top end. Felt I lost a lil in that important 2200-4000 range. As far as Auto Anything goes I will not shop anywhere else from now on. I've installed & used many different CAI(s), including OEM. This aFe CAI was fairly priced compared to other closed system CAI(s). The install was not as smooth as I hoped. Had to use some force to connect the tube between the filter box & the throttle intake. The filter box only used 2 of the original 3 anchor points. However, with the tightly fitting tube between the filter box & throttle intake, it doesn't move much. Once installed, it looks good & performs as expected. This is a well made system for the Toyota Tundra. I have had two K&N cold air system with both of them turning my check engine light on, saying I had a bad mass air flow sensor. If you have a Tundra and want more power and torque go with AFE, its price a little higher than K&N but well worth it. Looks and sounds great. You can actually feel the gains in HP when you romp on it. Gas mileage has improved 1-2 mi per gal. Highly recommend over others. Decent quality. Instructions are lacking. Be careful threading the bolts into the MAF housing. Easy to cross thread if not careful. There is a 14" piece of weather striping. Instructions do not tell you were to put it but it goes on the intake side inlet that fits into the passenger side quarter panel to seal the intake tube into the filter. It's not the best design. It should have been molded to fit instead of trying to make it fit by hand. As the title suggests, this is my second aFe Magnum Force CAI. I had a good experience with the previous CAI on my 2011 Tundra, so when I upgraded my truck to a 2015, I decided to stick with aFe again. Good fit (although it does rub on the engine cover), good finish, and an overall good looking product. The instructions still lack a bit, but anyone with decent mechanical sense can work through it. This intake is awesome. I got it professionally installed when I leveled my Tundra but overall it is great. Sounds throaty when you step on the gas but quite when I'm coasting, just what I wanted. I've only had it for about a month but so far I'm getting about .5 mpg better, which hey, when I was only getting 14-15 mpg anyways I'll take anything I can get. Overall, great product and I will definitely recommend to anyone. Shipped next day and the customer service was great! Reference # 764-435-786 © 2000-2019 AutoAnything, Inc.